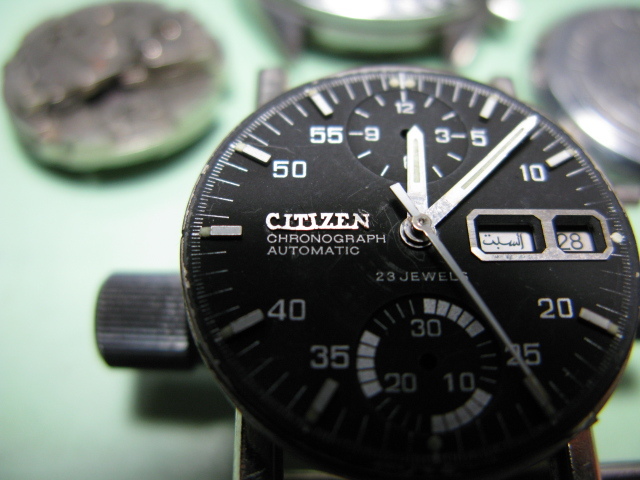 Hello and welcome to Stephen’s Citizen watch blog. If you’re a Citizen watch fanatic, you have come to the right place. Here you will find some of the finest and most comprehensive vintage Citizen watch archives in one place on the internet. I am pleased to be able to provide you with one of my watch restoration and service archives, as a contribution to Stephen’s hard work and effort. My name is Brian and I am a master trained watchmaker in the State of Pennsylvania U.S.A. I had the honor to be trained by the School of Horology in Columbia Pa. Which just so happens to be right next door to Lancaster Pa., the largest watchmaking capital in the history of the United States. The only school that was left in the country at the time to actually teach watchmaking. It was an entire year of my life, driving 120 miles a day, 3 hours total for 5 days a week. Worth every minute. 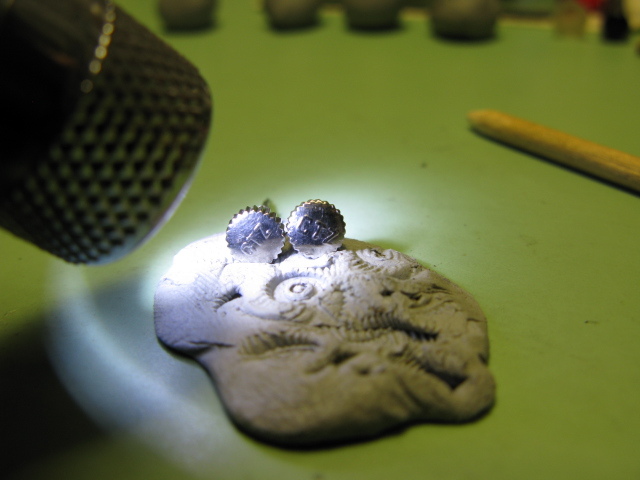 I got the chance to be trained by a very well regarded Master Watchmaker by the name of Jim Michaels. If you don’t know Jim, let me tell you a little bit about the man. I’m sure that you have all heard of Abraham Louis Breguet. Breguet was a very famous watchmaker that lived between the late 17 to 1800’s. He made some of the most valuable and beautiful complicated watches in the day. In the early 1990’s, Jim had the rare opportunity to create, from original blue prints, the missing pieces/parts for Breguet’s first minute repeater watch. Yep, serial number 1. Which is believed to be in Bruguet’s museum till this day. I am in awe of Jim’s skills, and with his teachings, and now I am able to bring you this. The Citizen 67-9313 8110a ‘Speedy’ is a very cool, collectible, fully mechanical 23 jewel automatic chronograph of the mid 1970’s. Mint ones are rare and hard to come by. These watches were used hard and really worn out in the almost 40 years they have been in existence. Most of them have already in that time been hacked or butchered in some way. A couple of years ago, I restored a white dialled Speedy for my collection. I have always liked the black dial version, and since then restored quite a few for customers. Their’s turned out so good, that I had to get one and add it to my collection. Let’s take a good look on the outside to get a general idea as to what we have to work with. As you can see, the bezel is not in that bad a shape. It’s a good thing because this part is a make or break item for the Speedy. You could spend $150 dollars just to find a good one, so this is a bonus. 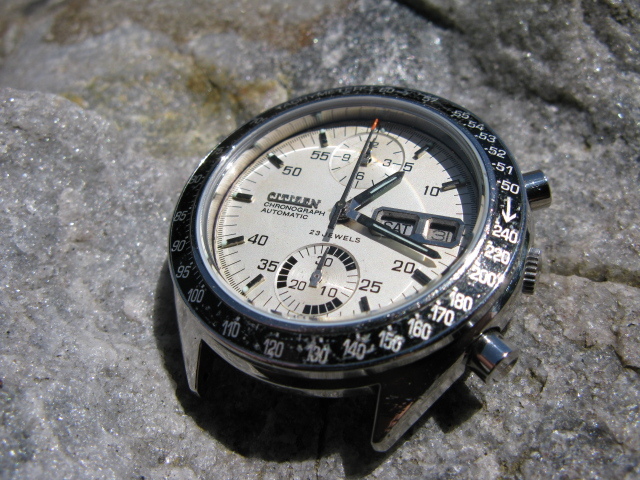 This Speedy was made in February 1977 and is a low serial number. The pushers are intact and are in pretty good shape. That is important because they are not available from Citizen anymore. 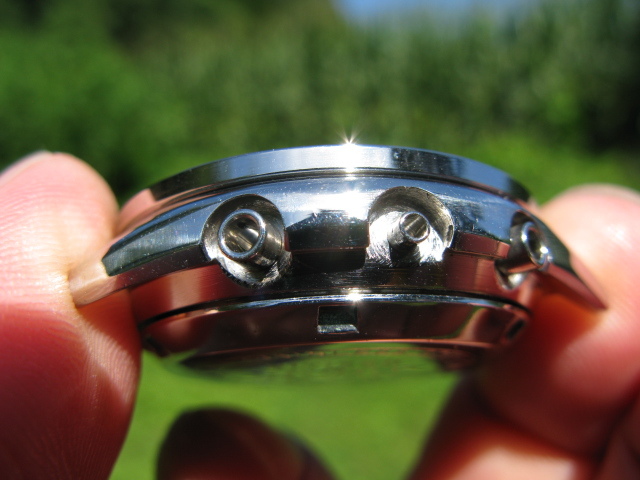 If you are missing one, or one is bent or chewed up from a previous watch butcher, you will have to find a parts watch. The crystal is shot and originals can not be gotten anymore. I spent a lot of time buying different after-market crystals to see which ones are the best and exact spec. I am personally not a fan of after-markets, but have bought many different brands until one fits my spec and quality standards. I stock new Speedy crystals, and you actually can’t even tell they are after-market, as you will see. The original crystal gasket is a must have. This crystal gasket fortunately is there, and it’s a good thing because they are also not available nowadays. Let’s open the hood and see what we have next…. It looks like the side view of a bad rear end car wreck. All bent to hell. 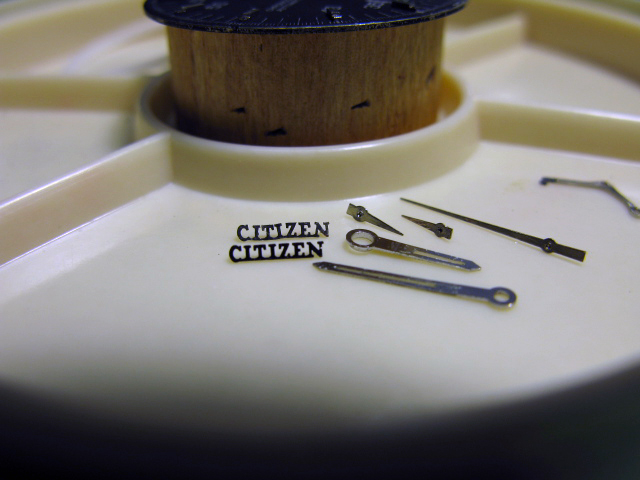 Those tiny Citizen logos are actually made out of metal, and are virtually impossible to straighten. On top of that they are extremely fragile and delicate. That’s OK, because I have a really nice spare from a 67-9054 donor dial. The logo has to be removed anyway for the dial refresh. I see so many vintage Citizens where that logo was messed up from yesterday’s botch-makers. 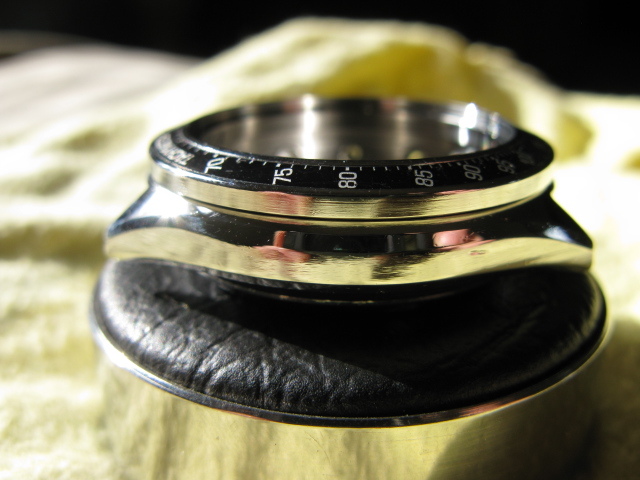 Take a look at yours with a 5X eye loupe when you get a chance, if it’s perfect you can actually see it. One little bend and the reflected light will show you where. When you’re this deep in a restoration like this, you have to look at every single thing. The effort put forth will be reflected, and pay dividends in the end. Worth it as you will see. Next we’ll take a look at the 8110a inside……. 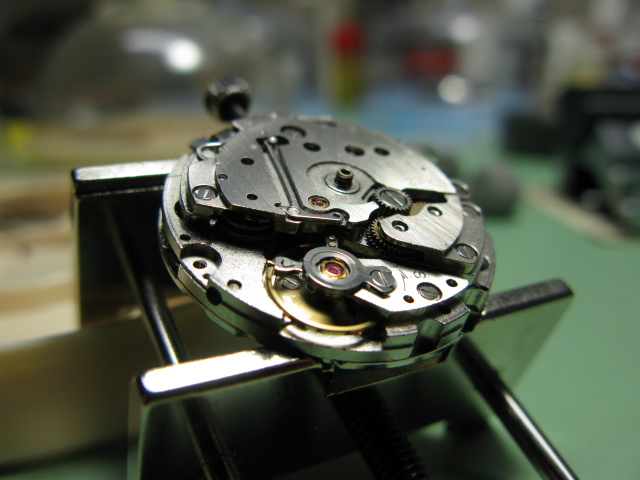 I prefer to repair and service an existing movement, and not break down a complete movement just for parts. I take these 8110a movements completely apart and examine each part one by one. Every jewel has to be looked at carefully. If it’s cracked or missing it must be replaced. If these movements are serviced to high standards, serviced properly and precision timed they will impress you with their incredible accuracy. I can get them within 4-11 seconds positionally with a zero beat error. 6-8 seconds is the average. Some of my customers will email me and say they have worn their 8110a’s for 3 months and they remain spot on. I have really enjoyed the positive feedback on the timing. This is important for the value of your Speedy. The original crown’s quality surpasses any after-market one you can buy. And speaking of the dial and hands, we’ll take a closer look at those next. 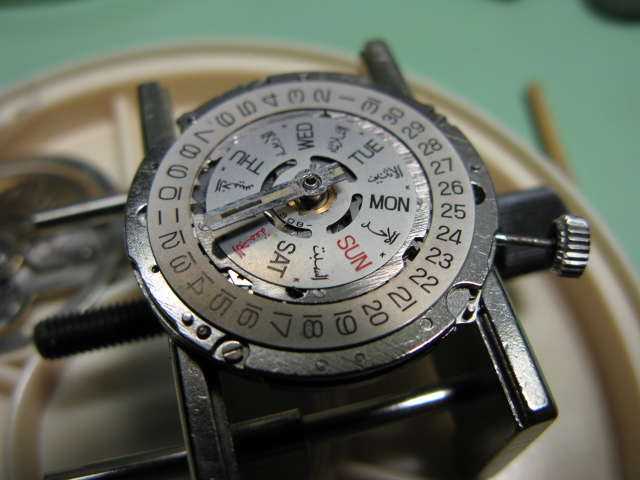 White dial Speedy’s are very difficult to restore because of the reflection they cast. 40 year old pearl mixed with white paint is next to impossible to repair. Mint, white dial Speedy’s are very valuable, and having them both as a pair regardless of condition is a must for the Citizen 8110a collector. I will showcase a variety of Speedy’s later at the end of this restoration. We’ll be taking a look at the case and bezel next. First order of business is to get the case, bezel and pushers removed. Large amounts of dirt must be removed and cleaned. 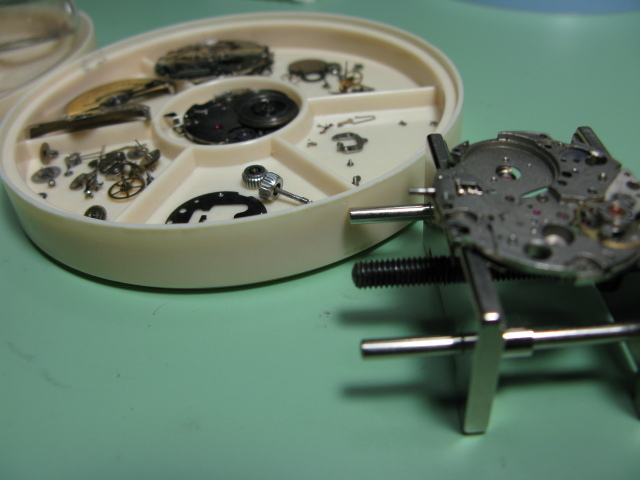 A perfectly serviced 8110a movement deserves a pristine clean case. Case and pusher tubes must be checked. Anything bent or damaged must be replaced, or pushers may stick which is unacceptable. I have seen watches that were claimed to be serviced, only for the movements to be put right back in dirty cases. I will clean and polish the pushers by hand. Installing new “O” rings to restored pushers is key to a quality job. I for one like original watches, so over polishing cases is a bad idea. While it may look pretty, it’s better to leave original case patina present. Nicks and scars are part of the play with watches that have led a hard life. Things have to blend, so nothing draws too much attention to itself. Once this part of the job is done, it’s time to prep the whole package to be brought together…. Take note of the zero beat error. If you put a Rolex chronometer in the timing machine, you would see the same perfect beat error. 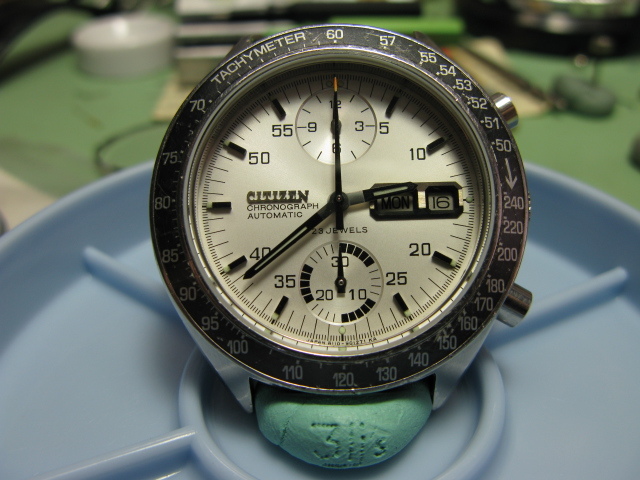 This is one of the marvels of the Citizen 8110a, and why I have devoted alot of time to them. They are so well made, and their timekeeping is excellent. Especially if they are serviced correctly, and timed with precision. The crystal is so clear, sometimes I think it’s missing, depending on the light angle. Worth all the time and effort. 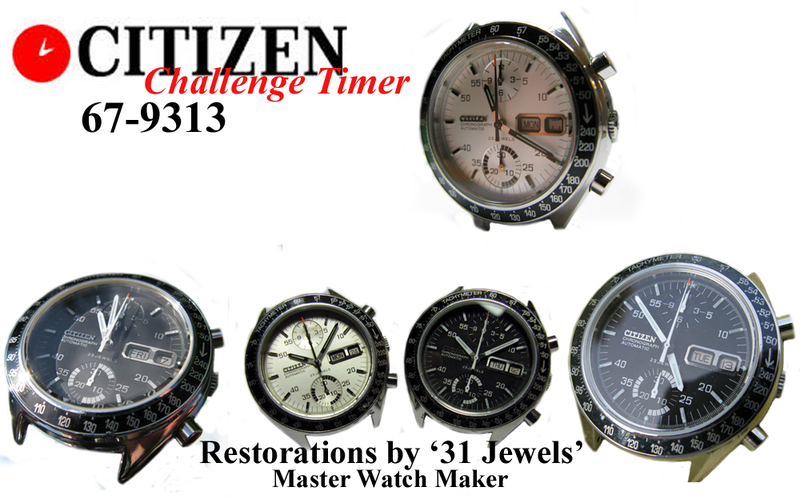 Thank you for viewing my restoration and service of the Citizen 67-9313 Speedy. As a tribute to this watch, I would like to show you some other Speedy’s that I have done for customers. This may be the most Speedy’s that have ever taken the stage at one place on the entire internet! Take a look……. Stephen sent me this incomplete and needing alot of parts. 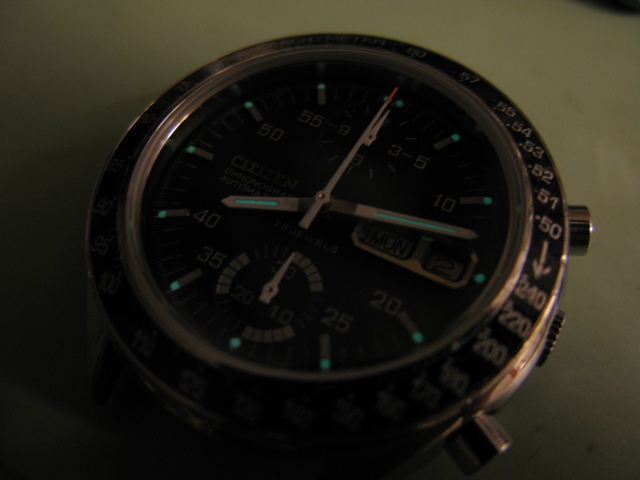 This Speedy was going to be his daily wear, since he has another black dial example that is very minty. You would almost think at first glance how he could use this as a beater. His example uses one of my spec crystals. This is without a doubt the most beautiful and mint white dial Speedy I have ever seen in person. I can’t recall at the moment, but I think he is the original owner of this watch. It’s as mint on the inside as it is on the outside. This is one of those Speedy’s that if it ever surfaced on ebay, would blow past $600 dollars. Maybe even more. Mr. H had accidently dropped his watch on a marble counter top. The crystal was so shattered, that it stopped the watch. It was full of very, very tiny shards of glass and glass dust. It was everywhere. I found shards stuck in places in the movement that were so small it would stop the watch at anytime. What’s amazing to me is how much shock the movement took at impact. It blew the escape wheels cap jewel and spring right out, yet it did not break the pivot off. It’s a true testament to how well built a Citizen 8110a is. I actually sold my white dial Speedy’s original Citizen crystal to him, because this watch deserved something better than aftermarket. Speedy white dials are virtually impossible to restore, as you will see in a later pic. Mr Vuong’s White dial Speedy restoration is perhaps the poorest Speedy I have done of them all. I have to give Mr. Vuong props (ed: proper respect!) for his patience and commitment to saving his watch from the junk pile. His was missing hands, calendar window, crown, stem, movement holder, both pushers as well as many broken or missing parts. He supplied a rough, and mostly complete, Citizen 67-9119 as a donor. 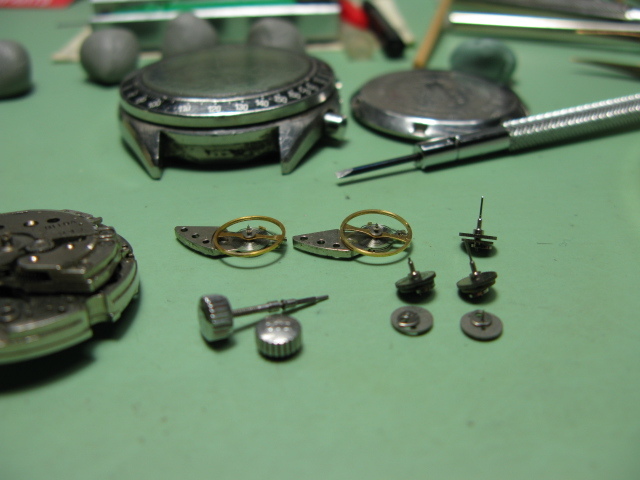 I was able to salvage many of the parts to repair and service the movement, as well as the watch itself. His dial had lots of imperfections which may distract someone who never saw this watch in its original state of despair. I restored everything to factory specifications using a new original signed Citizen crown, and my spec crystal. I must admit, his Speedy turned out excellent, and timed out superb. The dial has a nice glossy pearl reflection, and by carefully restoring matching patina, completes the look of originality. Hard to believe sometimes that this Speedy left the Citizen factory almost 40 years ago. This Speedy was a special job in the fact that it didn’t need any restoration. I have to commend Mr. McGivern for leaving his watch original and un-restored. Take a close look and you will see the excellent details, and original condition – especially the dial. It was not without its problems….. and mostly due to inexperienced botch-makers for sure. There was so much oil in this watch that the calendar wheels were completely soaked. As a result of the oil bath service it had in the past, the print was eaten right off and these cannot be cleaned. I had one last set in really nice condition for him. Calendar wheels are getting hard to come by in mint, and un-faded condition these days. Other than a bridge screw missing, and a full going over, it turned out top notch. He decided to go with my spec crystal and keep his original, as it had slight hazing. I must say, a lucky man owns this one! His restoration took two Speedy’s to make one. This watch was complete and running upon arrival but it had poorly painted faded orange hands, a bezel that was faded almost to blue in colour, and a filthy over oiled and dirty movement. 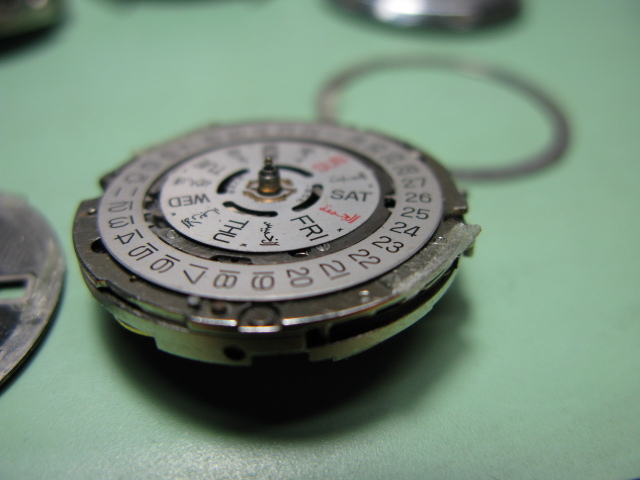 It took a destroyed, white dial with a near perfect bezel, just to make this watch. He wanted it to have the factory original look, and with my spec crystal….Wow! This is the watch that inspired me to do the restoration of my black dial Speedy. I really enjoy getting great Speedy’s stories like Mr. D’s. This was a watch that he has owned since 1980. It was used at first, then ended up in a draw for over 20 years because it didn’t work. As with most Speedy’s I get at the shop, it had been in the hands of an untrained botchmaker! Loose screws, massive over oiling, and a rotor bearing that was never tightened correctly. It was rattling around in the watch upon arrival. Mr. D chose to leave the watch completely original using my spec crystal. If you find a Speedy with a dial and bezel this sweet…..buy it. These watches are going up in value, as basket case Speedy’s have reached the $250-$300 dollar range. What’s trending in today’s market with watches and cars is…unrestored. Collectors are understanding that owning a factory original is much more fun, even though it’s not perfect. As with unrestored cars, watches like Mr. M’s Speedy can be used everyday, with out the worry of a bump or nick. With some minor dial restoration, and my spec crystal this Speedy is a good looker with excellent original patina. It’s been a real pleasure to have all these Speedy’s through my shop. Now….we see them all together in one place. All so different, and unique in their own special way. Mr Williams got a lucky break shortly after he sent me his white Speedy. A three watch package deal surfaced, and he was able to acquire a rough black dial Speedy with a very nice bezel, a Challenge Timer bullhead, and a decent 67-9119 with a near mint movement. With those donors, I overhauled and serviced the 9119’s movement, and precision timed it. The black Speedy donated its bezel and Citizen dial logo. I custom fitted the 9119’s metal movement holder to the Speedy case, and of all the pushers available….the best were used. A full lume, complete hand and dial marker restore compliments the watch very nicely 🙂 Other touches of this full restoration included a Citizen logo swap from the donors and one of my spec crystals. Another white dial Speedy saved and restored to the highest of standards, that will provide many years of enjoyment. This was a parts Speedy that I thought would be just that. Mr. Williams had gotten a package deal where this watch had a dial and a parts 8110a movement thrown in a case. When they arrived I was not thinking I could bring this one back. So it was left for the white dial Speedy to be made – see #9 above 🙂 Mr. Williams wanted a black dial in the worst way and asked if there was anything I could do to save it. So…it flew back to Pennsylvania from the U.K. with the remainder of what was left from the two previous project. This dial was about as bad as mine….no… it was way worse. I gave no guarantees because it had solvent, or some type of water damage that left the black paint finish very unstable. I spent hours cleaning and restoring this dial with my blend of primer, using a single brush hair to repair paint loss missing near the sub dial numbers. Hour markers were restored and re-lumed as well as the hands. 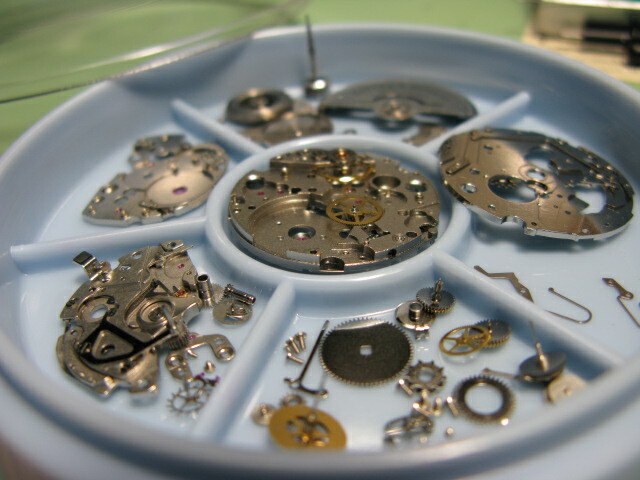 The movement was rebuilt/overhauled with the remaining 8110a parts. It was a full restoration to factory specs, using one of my spec crystals. Sometimes you get that one picture that captures the essence of a really nice watch. I am proud of how nice Mr.K’s watch turned out when it was finished. Mr. K’s black dial Speedy was a full restoration. Using a white dial donor for its bezel, all the best parts were used to create the best Speedy possible. Some movement parts were needed and, after the full overhaul/service and precision timing, it ranks in my top 10 list of the most accurate 8110a’s to date. I personally love the look of the “ghost” bezel – I have seen ghost bezels on very old Rolex Sea Dwellers, and it actually makes the black dial contrast very well. A very cool look 🙂 Mr.K’s Speedy is using one of my spec crystals. Mr. Miller’s black dial Speedy has led a very hard life. Even though its condition is worn, it’s still going strong today. When we look at watches like Mr. Miller’s, its easier to appreciate how the nicer ones look. How in our life time we may never wear a watch out to this point. 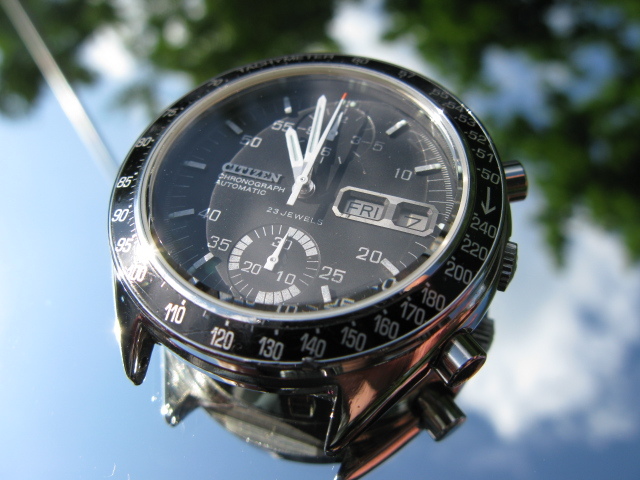 A Citizen Speedy owner doesn’t care that his may not be the best, but the fact that he has one…and with probably the most miles…or seconds logged. 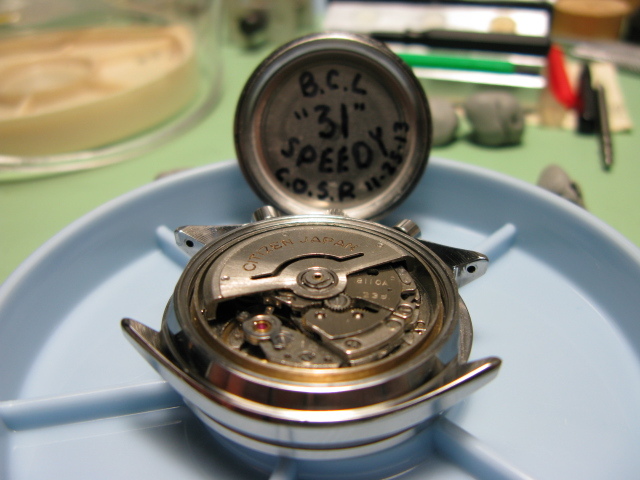 Mr. Miller’s Speedy is one example in which the 8110a movement that powers it was the most worn I have ever seen. Everything needed some kind of attention, so a full restore was in order. As you can see, even the dial has faded, and some careful touch ups were made. 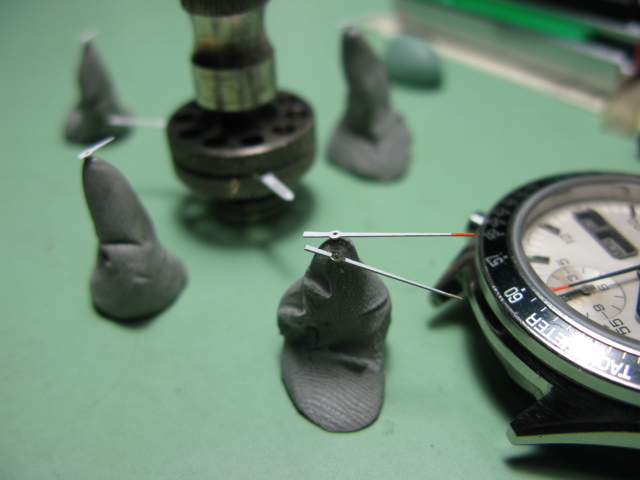 It’s so hard to tell because of the type of primer I use to match each individual Speedy’s watch dial. Mr. Miller’s Speedy received a full dial refresh and lume, plus a hand restoration/full overhaul/ “o” rings and precision timing. If you own one model watch of any kind, its very hard other than pictures of course to compare it to others. Having the honour to have this many Speedy’s through my shop has allowed me to compare and grade Speedy’s from every continent of the world, in various states and conditions. Mr. Merson’s Speedy has impressed me with the finest of dials (not a scratch or tool mark), case and bezel originality. This Speedy was a rarity in that it was so close to NOS that when I opened the back, I didn’t at first glance think it had ever been touched. You see some sweet bezels here, and to some just that part can make a man drool. Sadly, this watch had been in the hands of a hack. Someone in the past tried to oil this up to get it to run and broke the dial feet. Worse is they had used some kind of super glue to try to put the dial back on. 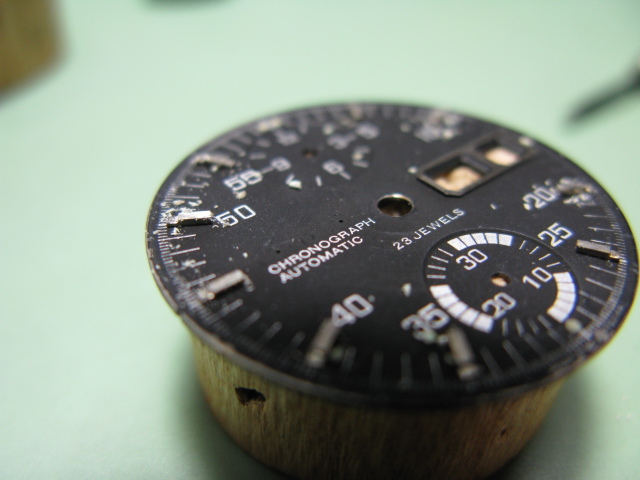 The concentrated fumes had discoloured the near perfect dial in a couple places. Seeing this has educated me in the white dials because I always wondered what caused dial dis-colouration. Dials that were glued on with a strong solvent base react with the pearl white paint type used on a Speedy. If you look at other white dials here, you can see just that. Dials that were not glued on even in worse condition did not have this type of damage. Something that caught my attention about Mr. Hoolihan’s Speedy was its serial number. I had seen low serials before but none this low. I always have been interested in low/early number serial cars and watches. I had to check my Speedy data base and to my surprise found this is the lowest number of them all. Meet #34. I asked myself..hmm. Are there any earlier ones? Who has Speedy number #1? I’d love to know. Mr. Whitfield’s’s black dial Speedy was in really nice original condition. It looked to have little use, and was well cared for. The only real flaw the watch had was the minute hand had some noticeable chips. 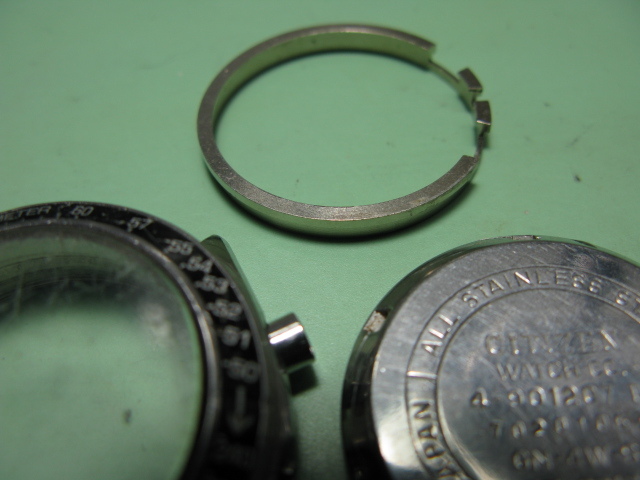 Not really sure what had caused that, other than some bad watchmaker work where tweezers may have been used. Yes this Speedy was imported for the German market. German date wheels were made and I have seen only one other… and it was in a white dial. It’s exciting getting all these different Speedy’s in my shop from all around the world. I have been able to gain a lot of knowledge as to where they all went when produced in the mid 70’s. I have recorded interesting serial numbers, and production dates in the last 8 years and was surprised at my findings (I’ll post about the serial and production dates at a later time). It had then gotten in the hands of an inexperienced friend who proceeded to make a mess of it. It arrived with a broken hour recorder and a missing hour sub dial hand. Parts..especially OE hands are getting hard to find now, but I was able to save the day….. I was able to locate the missing hand and a new hour recorder pivot. The dial survived and is in just beautiful shape. I restored all the hands to factory spec but left the dial/case and bezel untouched. With my spec crystal and a full loving over haul and service it’s now back in Germany on the wrist again, being enjoyed for years to come. Mr Greuter’s white dialled Speedy came to the shop after it had been in the hands of another bad botch-maker. It was missing one hour recorder hand and had a broken hour recorder pivot. The minute recorder hand was incorrect also. Speedy sub dial hands are slightly different than the bullheads or other models – it took quite awhile to find the correct hands for his watch. Mr. Matos’s Speedy arrived at the shop as a parts watch but was in pretty nice shape. The bezel looked really good and it appeared to have its original movement. It was in need of some serious work though. Both pusher springs were needed, there were four missing screws, and a main driving gear spring, plus one “c” clip for the pusher was the start. Years afterwards and it had been in the hands of another botch-maker who actually did not harm the watch…..(yeah). Lots of oil oozing everywhere, but it appears it was never actually overhauled… ever. So, other than a full overhaul, cleaning and a “31 Jewels” spec crystal….the watch remains 100% original and unrestored. It was a joy to bring this watch back to life, and give it the respect it deserved. To his Dad, and to all Veterans from every country…….I thank you for your service and I salute you. Mr. Castro’s Speedy arrived missing some key parts. The hour recorder pivot was broken and it was missing its recorder hand. Both tough parts to find, and my stock is running very low. The sweep hand was MIA, so I had to restore one back to spec to match the watch, as well as the hour recorder hand. 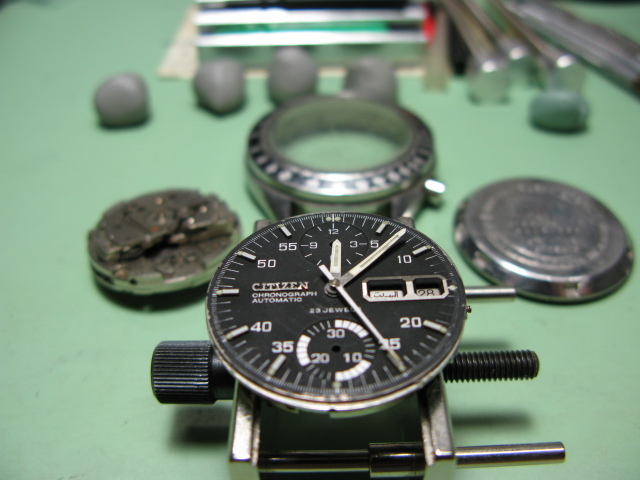 Now with everything sorted, overhauled, and restored with original Citizen parts… it’s ready for years of enjoyment. Mr. Cody’s Black dialled Speedy arrived in pretty nice shape, and was complete. Other than restoring back to the original spec of the hour recorder hand and sweep tip, everything else was pretty good over all. I did make a retaining ring to help keep the plastic movement holder in the case from moving around. 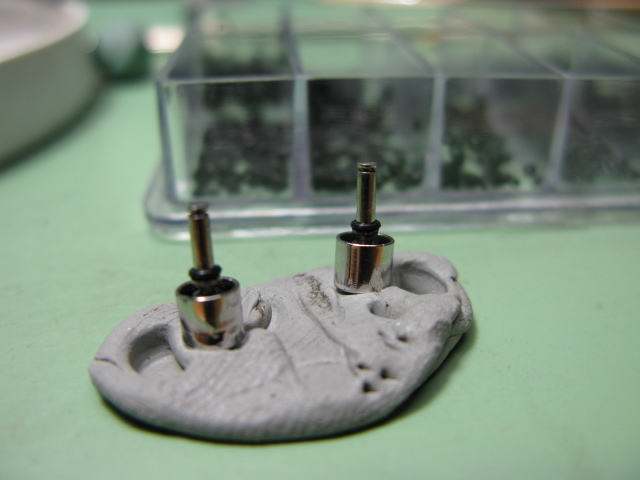 It helps a lot……but it does not hold nearly as good as a metal movement holder with screws and clamps. Plastic movement holders are getting pretty fragile as the years wear on, and I warn future collectors to make sure that the Speedy your buying has a movement holder that is not cracked, or broken. I’d like to introduce “The Speedy Mod” – yes…this is the first custom Speedy out of my shop and is a unique, and convincing one. What makes “The Speedy Mod” special is the custom inner bezel Mr. Alexandra made for this watch. I have seen Speedy’s on eBay done like this a few times…..and to my surprise sell in excess of $600.00. 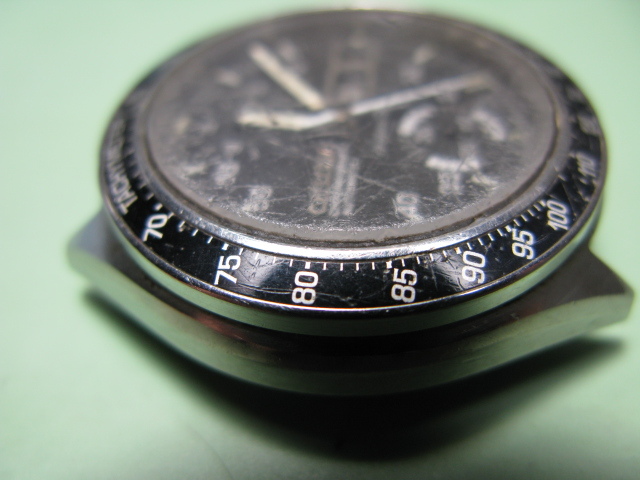 However…none has the custom inner dial bezel, or have been done to this level… which separates this one from the herd. 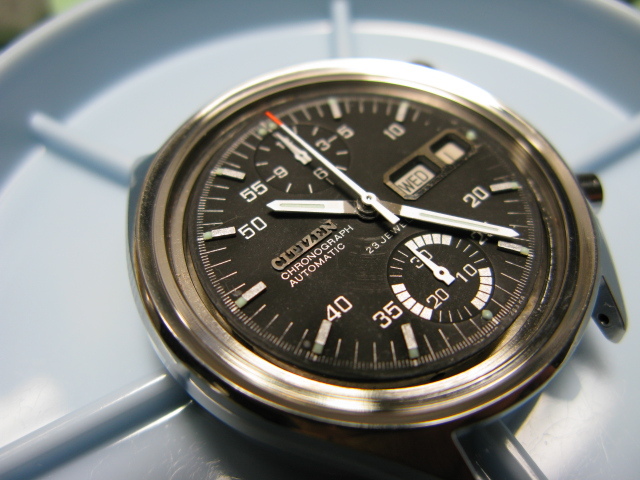 The dial for this custom Speedy comes from an original Citizen 67-9038 in black. 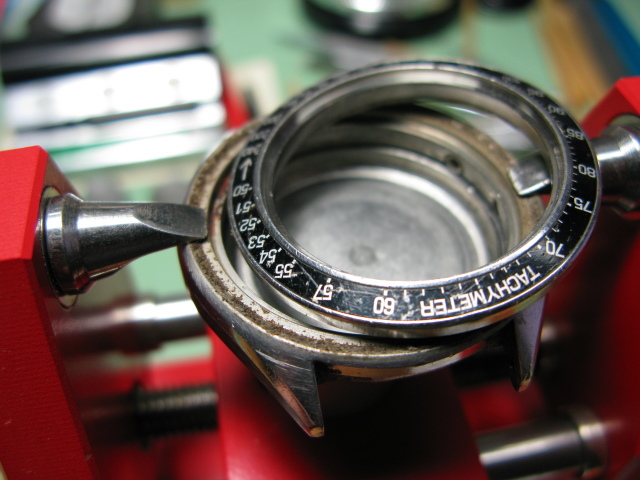 If you notice on the outside of the dial of a 9038, it has the tachymeter on it as well. I think it looks super cool and….it gets to keep a black set of 9038 date wheels. The entire watch is in beautiful condition and, one of a kind. My white dial Speedy shown here was a two watch package deal. The dial and hands are original, and unrestored. As I mentioned earlier, a white dial Speedy is almost impossible to restore. Depending on the light angle, you will notice Citizen mixed pearl in the white paint, and this is what makes a white dial Speedy so special. 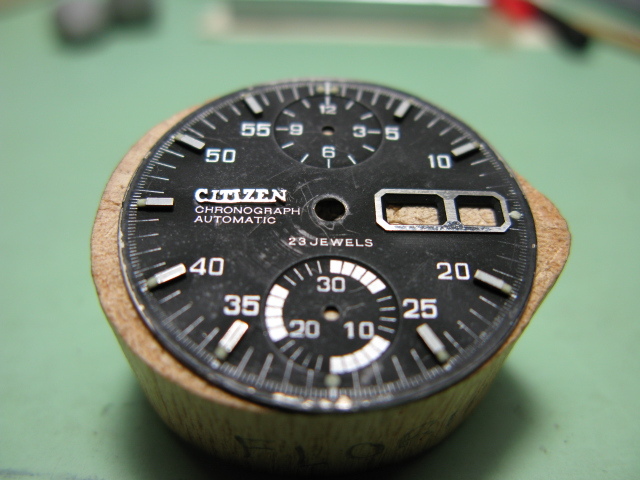 Have you ever seen a Citizen 67-9151, or a Citizen 67-9054’s dial? They are like that. You can’t get that effect with black. 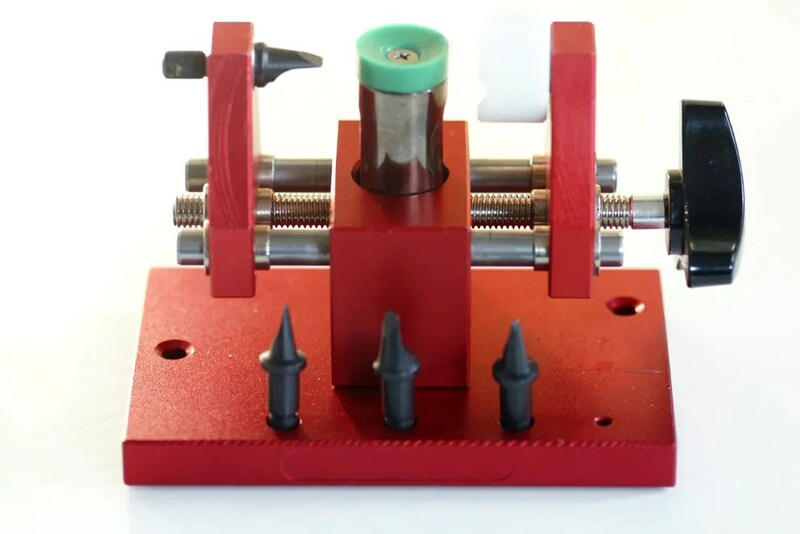 At the time of this writing, I have no solution other than a re-dial, to repair damage done by tweezer scratches, or damage done by recorder dial hands being pressed down too tight. If you have a paint formula idea, drop me a line! 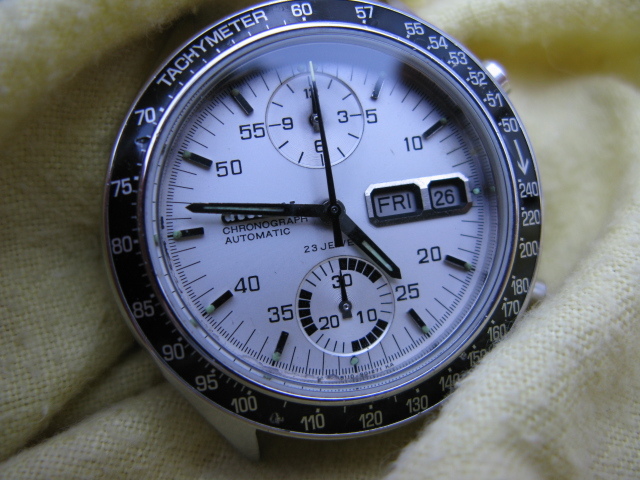 I posted a brief write up in the WUS forum using my Omega Speedmaster and my white dial Speedy. Here: http://forums.watchuseek.com/f21/8110a-citizen-speedy-meets-omega-speedy-650836.html. It’s something you might find interesting. I sold the black dial Speedy shown in that thread, and really wished I had kept it. At the time though, I could’nt get a nice crystal for it, and longed for another. A journey which led me to the watch you see here today – my black dial Speedy, parked right next to my white. I thank you for taking the time to view my restoration and service. 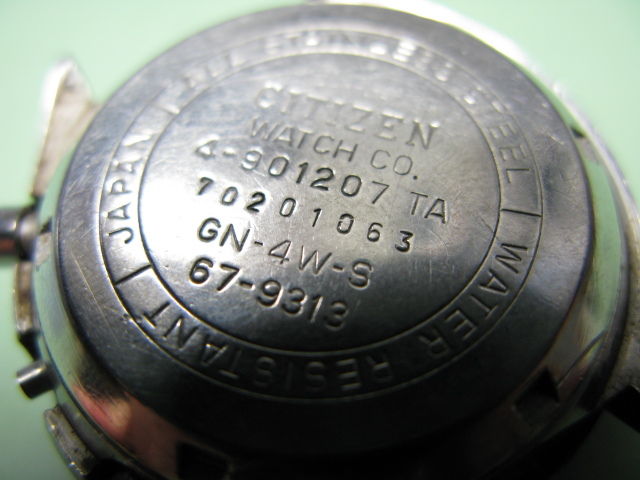 And thank you Stephen, for allowing me to contribute to your vintage Citizen watch blog. Brian, is this watch from Turkey…? I just bought one from there, 67-6054 and same seller sold Speedy recently. It´s in terrible condition, consider the case and dial, but movement looks good and i´ll get spare parts from it, if necessary. I have a photo but can’t see where to upload it here, sorry? Hi Sara, thanks for visiting my blog, and no problem posting a comment here 🙂 Unfortunately visitors aren’t able to upload a picture here, but I can email you and you can send it to me. That would be very helpful – so far I know what movement was used in your watch (6628) but I don’t know exactly when that was in production. A look at the style of the watch, and the case back if possible will be useful in trying to get more info for you. A delightful read! Thanks Brian and Stephen! Wow, I feel sorry for the Citizen Chronos waiting in bins and stores and desk drawers here and there that DON’T get to meet you. To see that level of attention all focused down on one small object, bringing it back (but not too far back), is really inspiring. Can’t wait to see the final outcome. Great work Brian. La restauración marcha de manera excelente, espero impaciente el final. Just Marvellous !!! That´s a great job you have done, Thank you very much for this thread ! It has been a pleasure to watch how a guy, who knows how these things should be done, works !!! Little by little i´m changing my mind about the Dials. My principle has been, that the dial should be repainted or at least repaired to the state, where it looks like a new and flawless. Well, there is not just one “way”, these should be considered individually. So, Brian made it from impossible to possible and now we can see one example of carefully “touched up” Speedy – dial :D.
Once again: Amazing work ! hi Marko, thanks for your comments 🙂 Your observations about dials is interesting and seeing what Brian has done on this one, and others I hope we’ll get to see, shows what can be done in a skilled and sympathetic way. I’ve been following this from start to end, and I’m amazed at your work(Brian). From a watch that was in a broken state all the way to a piece of beauty. The others are equally amazing, and I am looking forward to my completed Speedy! White or off white gloss base layer and then a light coat of the prismatic or semi transparent alclads *might* get close ? I was lucky enough to have purchased a beautiful white dial “Speedy” a couple of weeks ago wow these are amazing watches and at around 85% it’s a stunner. Your skills are unserpassed in restoring them when I need a movement service your the guy I want. Stephen, do you know what the original band of the Speedy looked like? Brian is pretty much done with my Speedy, and the last thing is a band. It has an old Citizen band, but not the correct one. I’ll try to get one in a similar design as the original. Hard to tell the exact style, but I guess its President-esque. I’m thinking a Hadley Roma President band will suit it. Certainly looks good on the Speedmasters in a Google image search. I believe Brian will be putting up a write up about my Speedy soon. Any band styles you think are a close match? I’m not the best person to advise on bracelets, since I prefer leather straps! 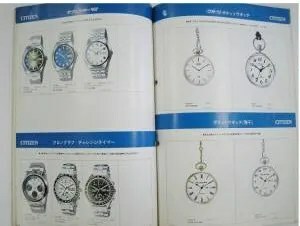 Given that the Speedy gets its looks from the Omega Speedmaster, and looking at the catalog image, I would think a style used on the original Omegas would be suitable. Looks like my bracelet choice was very close. Images and story in the link below. And you could add your Speedy’s too. I have seen some examples without a signed crown…Brian’s comment above suggests that’s a warning sign of possible trouble inside…would you suggest steering clear of those? Hi Brian, I have a ‘speedy’ with a non original unmarked crown. Do you sell crowns that will suit? Aftermarket will do as I know that originals are hard to get. How can I contact you, web page? Hi Stephen, I am afraid I didn’t receive your email about the speedy crown. Could you please send it again. Am I able to get an email address for Brian to have my White Dialed Speedy movement serviced and any other recomendations done to the watch for from him. Hi Brian, was just wondering what the average price of restoring a speedy would be? I’m looking for my first chronograph and the Citizen has got to be one of the most underpriced I’ve seen. However, the ones I have found online are mostly badly scuffed on the crystal and partially working. I have been searching through the WUS forums and this is one watch that has definitely caught my eye. I look forward to hearing from you. Hi Justin, sorry for a slow reply. I can try and find out what a typical price may be, but of course that is likely only to be for a service since parts and restoration work will vary according to the condition of a particular watch. Hi Stephen, I understand that it varies from watch to watch, but just a range would be good. Would it be easier for you to email me? You can contact me at the email I used to comment on this website. I would also like to receive Brian’s contact information if possible. I recently purchased a 8110A ‘Monaco’ that needs an overhaul and I would like to get a quote from him to do the work. Thanks for your assistance and your work on this great Blog. Hi Paul, thanks for visiting my blog, and congrats on acquiring your Speedy 🙂 Email sent. I have to say thanks for the recomendation Brian is truly a watchmaker my white dial speedy is superb and keeps time to 4 seconds a day truly COSC Specs, I have already contacted Brian regards the black dialed speedy and will send that away for the works early in the new year. Can’t wait. Hi Mark – great to hear about your Speedy and the quality of Brian’s work. Thanks for taking the time to post your comment. I am interested in having my white dial speedy refurbished. Where can I email you some pictures? How can I get in touch w/Brian to see if he would be interested in looking at my 21 jewel Super King ,67 export model. B2810a s/N 7050469. May I know Brian’s contact details so I can inquire for his amazing service? This is such a great article! Thank you both very much! I’m in your area and hoped you could send me Brian’s contact info. Also an address if you have a shop I could visit. Hello Stephen. Can I get Brian’s email from you? In need of his help for my Speedy! Any chance you can send me Brian’s contact information as well? Hi Stephen – Mark from Perth WA can I get your email address please I have had a laptop melt down and lost it. Hi Stephen. How do you find a new crystal for the Speedy. I might buy a Citizen Speedy and it could use a new glass. I spent a lot of time buying different after-market crystals to see which ones are the best and exact spec. I am personally not a fan of after-markets, but have bought many different brands until one fits my spec and quality standards. I stock new Speedy crystals, and you actually can’t even tell they are after-market….. Please note though that Brian is not a parts supplier, but if you send a Speedy to him for service he can fit a very good after market crystal. Thank for your answer Stephen. I haven’t bought one yet but now I will know where to go. But why is the very low amplitude (140-150) compared to Your Speedy’s 8110 movement’s 250+? Check your lift angle, you have measured your watch with 52 degree, lift angle of Citizen cal.8100a is 36 degree. But i guess your movement needs cleaning and fresh oils, 140-150 sounds relatively low amplitude, so it is not up of just lift angle issue. Thanks for your quick reply! It’s an interesting thing because if I start the chronograph and measure with the same settings the amplitude is around 230-240 degrees but the beat error ascend from 0.00 to 0,5-0,6 and the accuracy will worse (+/- 25-30sec). It seems like the chronograph part affects the running of the base movement, isn’t it? Do you still do 8110 restores? I have one that I would like to have looked at. I suspect it might be in fairly poor condition. I know the case has been refinished and the hands have been poorly restored. Also, the CITIZEN JAPAN text on the rotor is quite faded, and I’m not sure what could have caused that. However, the caseback does match the watch. Could you forward me Brian’s contact info, as well? Hey sweephand, any chance you could forward Brian’s contact details to me too? I’ve got a white-dial speedy which could do with some love, and from these posts it seems that Brian is one of the few guys prepared to pay attention to detail on these beautiful Citizen chronos! Hi Stephen, I’ve loved reading through this post here. I’ve just purchased a Citizen 67-9313 off of eBay, and I’d like get in touch with Brian to talk about a restoration. Would you mind forwarding me his contact info? Thanks, and love the site you’ve got here! Hi Dylan, thanks for visiting my blog and for your kind comment. Email sent with Brian’s contact details. Hi there! I have a 8110A 67-9119 that could use some movement servicing. Can you send me Brian’s contact info? Thanks! I’ve got my 8110A from my father. My mother gave it to him in the 70’s and has been in use until somewhere around the 2000. I always wanted to restore it and prob. fix it since it does not keep up with the time. could you give me some info about someone doing this kind of job? Let me know if you want to get in touch with Brian and I’ll email his contact details to you. hi, would you please send me the contact email of Brian for a Citizen Speedy restoration? Hi, can you please send me Brian’s contact email for a Citizen 63-9313 restoration? That watch in Ebay-link is unseemly over-prized (my personal opinion 😀 ). It´s rotted all the other respects, but there´s a chance, that the dial could be in usefull condition, can´t see it clearly from the pics, but “Citizen”-logo seems to be in very good shape considering the rest of the watch! 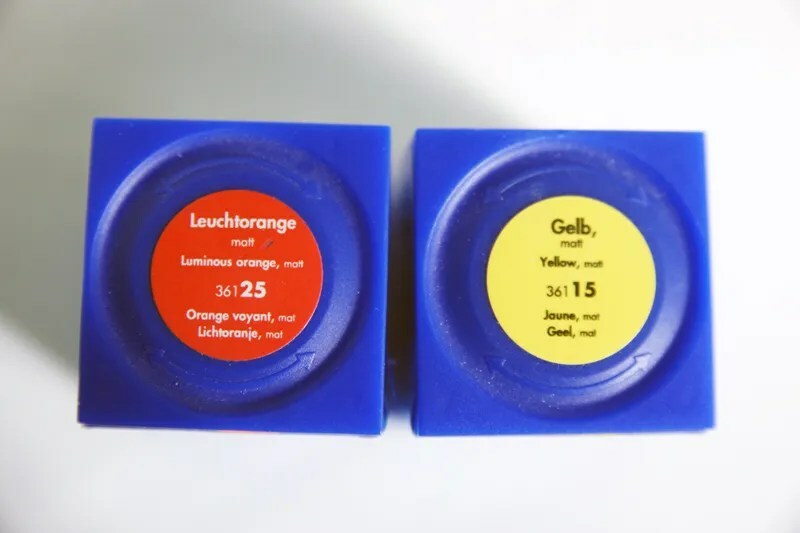 As the dial is not been made like many other dials at that time, meaning first painted and then lacquered and after or between those steps, there was printing of indexes and other markings and raised indexes was added as a last step of the process. But the dial of 67-9119 have been made in a totally different way: the base of the dial is made of plastic! 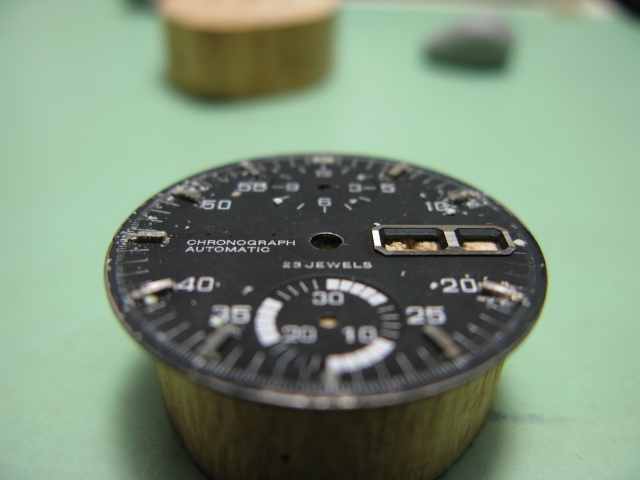 Even a foots of the dial are made of plastic. 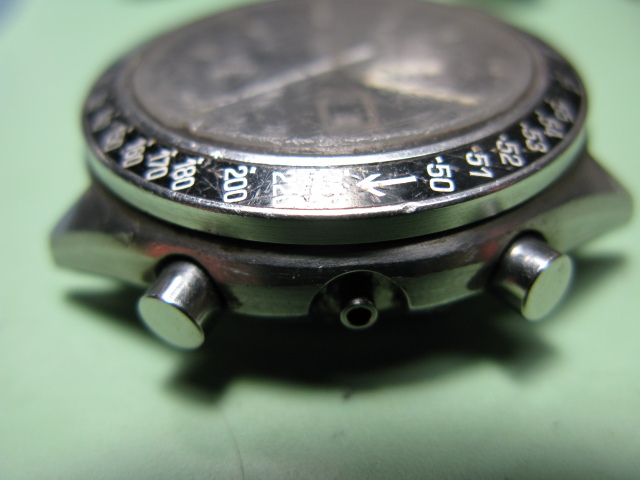 This made it possible to shape the dial as it is, rising rim in the edge of the dial and that unique shape in the middle section of the dial. Indexes are printed with white paint and Citizen-logo is that same, made of steel, as there is usually. Rising, lumed hour indexes are propably clued, as is the logo, to the dial. I´ll send a few photos from the 67-9119 dial to Stephen, he could then add those here? Sorry for long lecture and there could be some inaccuracies in details :D. Please, correct me, if you find some! Thanks for your comments Marko, and no worries about the length of them they are very welcome 🙂 I agree the possible donor watch on eBay is a bit expensive, but the seller is open to offers…. It is very difficult to send the watch to you from India. Can you help me any way to restore the same. This my best collection and i have the proud for the same and hence, too much eager to restore it any how. Hi – Thank you for visiting my blog and I do apologise for my late reply. Sorry to hear about the problem with your white Speedy. Do you have any photos of the watch and the corrosion? Although you can’t post images directly here you can post a link if you upload photos to somewhere like Photobucket, or I can email you and you can send them to me. Please note that I am not a watchmaker, that is Brian whose work is featured on my blog, but I can see if I can help with getting some advice. Hello! I’m in Florida and just picked up a Citizen Challenge Timer ref. 67-9356. Is there anyway I can send it in to get a diagnosis? Or does anyone have information for a good watchmaker I can send this to? Thank you! Hi, I am interested in having my speedy refurbished. Could you please send me Brian’s contact email? Thank you! It’s great to see the new additions to your blog, especially when your own Speedy is featured! Hi Stephen–Would you kindly email me Brian’s email/contact info? I’m in need of an overhaul of a very old Citizen that I just acquired. Thank you! I would like to buy a Speedy white dial, I want it for wearing it, so it must look good and be in good condition. Could you please advise Brain’s contact details so that I can check if he could sell me one ? Or perhaps give me some advise on what the going rate for a good one is, where to look for it (none on ebay for a while except for one with a very damaged black dial), and what I should check before buying it ? Hi Bart, sorry for a slow reply. Thanks for your kind comments, and good to see you are enjoying the blog. I know the white speedy is scarce these days, especially in good, wearable condition. I’m afraid I’m not aware of one for sale at the moment so can’t help with that, and I’m not sure what price a good one would fetch these days – I would imagine over $500 (US), possibly a lot more! Other than eBay you could look at Yahoo Japan, although I don’t see many Speedy’s there. Or maybe try a ‘want to buy’ post on the relevant forums (e.g Wrist Sushi and SCWF) although you might have to be an active member for a bit before you can post a want to buy post. Brian isn’t a watch seller, but I’ll get in touch with him and see if he knows of one for sale. 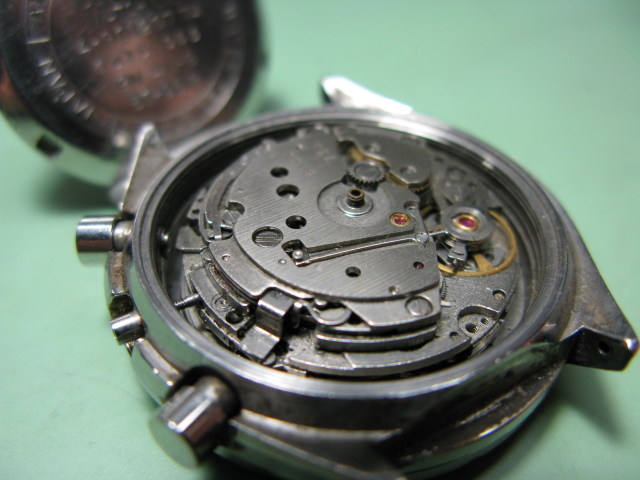 When looking at buying an 8110 chronograph, I would advise to always ask to see a photograph of the movement if it’s not already provided – look for a ‘clean’ movement without corrosion. Check that the chronograph functions are working correctly, and that the chronograph hands snap back to zero (the 12 o’clock position) when the chronograph is reset, or restarted using the fly back feature. Also check that the quick set date and day mechanisms are working correctly (although I have known where a seller didn’t know how to quick set the day – it’s done be pressing the chronograph re-set button when the crown is pulled out one step). 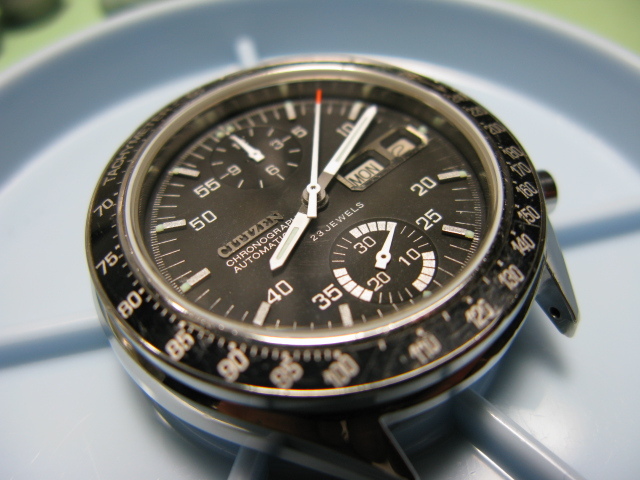 And check that the case back is correct for the model – 67-9313 for the Speedy. Hi Bart – sorry for the delay in replying. I have heard back from Brian. Unfortunately he has nothing for sale, and doesn’t know of one for sale at the moment either. His view on likely price, for one in excellent condition is similar to mine, i.e. over $500 and maybe up to $650. I’m sorry I can’t give more positive news. Hi, i found this blog surfing the net looking for a speedy white dial: i had one in my youth, but i lost it. It’s very difficult to find another one but i don’t give up. It is possible that there exists a version with blue dial?? I found one surfing the net, but the bezel is very ruined, discolored. 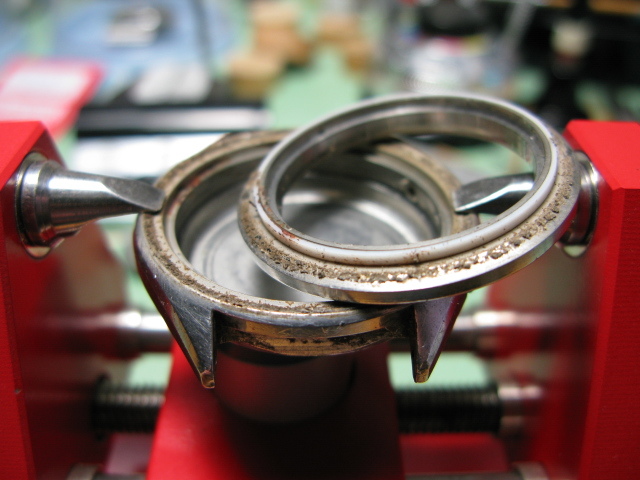 I am a fan when I read these knowledgeable post on restoring and bringing beaten watches back to life..
Is it possible to contact Brian on restoration and overhaul services? Hope you can help as I ernestly seek advice regarding my vintage watch. Just found your blog. Very nice. I have a white dial Speedy that needs a restoration. Would it be possible to send me Brian’s email. I tried to contact him thru Watchuseek with no luck. I too just found your blog. Fantastic information. I recently purchased an 8110a bullhead that needs servicing. I attempted to contact Brian via Watchuseek, but have not heard back from him. If you could supply with with his contact information I would greatly appreciate it. Thank you. Hi Stephen. Great work you’ve done on these Speedys. Ever since i read this, i have been on the hunt for a piece like this. Well, i may have found a decent example. My concerns are the register hands & sweephand are of from a different model and the crystal has issues. By any chance you can help me out in sourcing these? Hi Rich – email on the way with Brian’s contact info…. 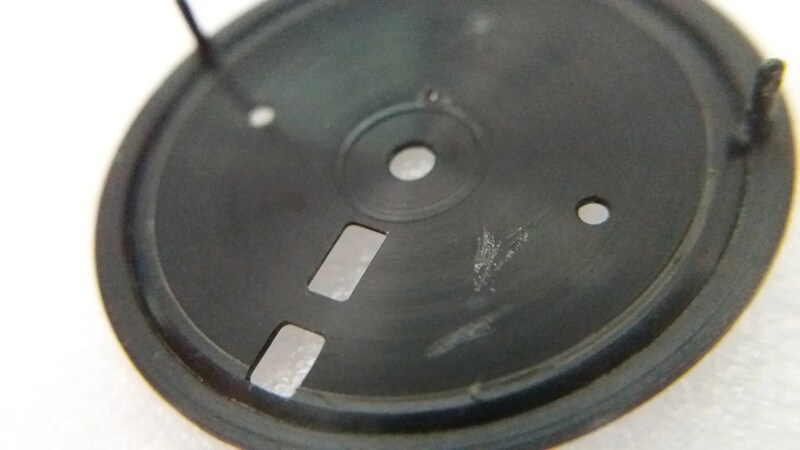 Please be aware that this model uses a crystal gasket – if you don’t have a replacement gasket, it is possible to remove the old glass carefully and re-use the old gasket. But care is need since the gasket can easily get kinked. Thank you for reply, i think is 28,7mm. I ve found a vendor on ebay that sell it. 2mm thickness Is Ok? is it possible to find the black insert? mine isn’t black, is like … grey. Probably the sun has done effect and took the black to gray. Mmm.. I see.. Bad luck then. 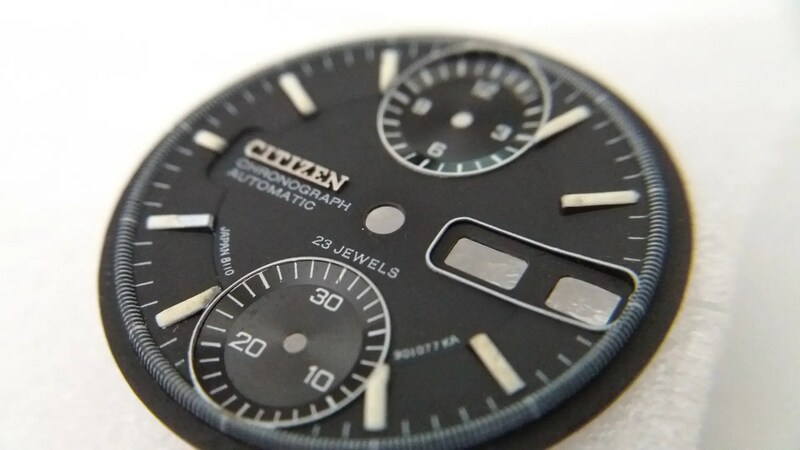 Your work on these Citizen watches are amazing. 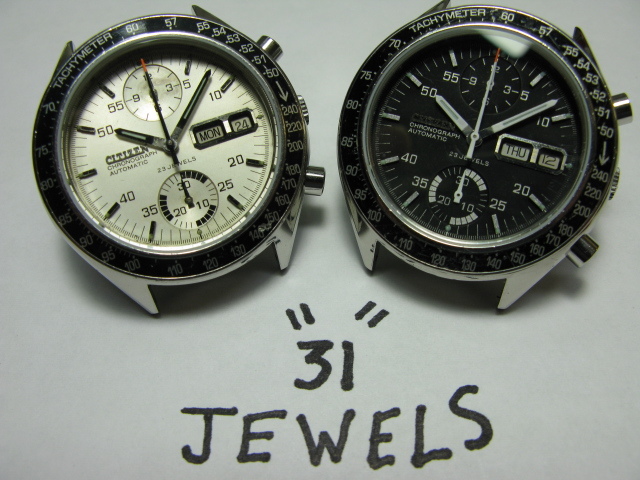 I have 2 vintage Citizen chronographs which I hope you can help me with. Can I have your contact, please. My most sincere apologies. However, there were some technical problems with my email inbox and I lost the email with Brian’s contact. Could I have it once more, pls. So sorry for the inconvenience caused. Thank you Stephen. Hola Stephen, grandioso blog, información valiosa, todo el contenido y fotografías. Un par de preguntas, como puedo quitar el bisel de mi 67-9313 para poder llevar a cabo una buena limpieza de la parte interna y con que tipo de pintura se pone el toque naranja en la aguja del cronografo?. Gracias por tu magnifico trabajo, se nota el amor y pasión en lo que haces. [Hello Stephen, great blog, valuable information, all content and photographs. 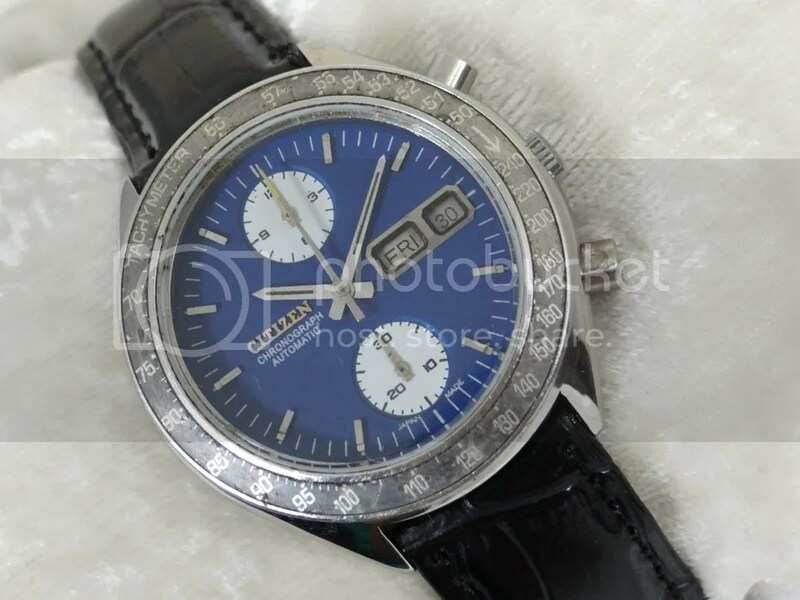 A couple of questions, how can I remove the bezel from my 67-9313 to be able to carry out a good cleaning of the internal and with what kind of paint the orange touch is placed on the needle of the chronograph ?. Thank you for your magnificent work, you can see the love and passion in what you do. Se necesita un gran cuidado para presionar el bisel de nuevo en el caso, y para asegurarse de que está en la posición correcta, por supuesto. Sri, Simply u. r Great, I have one kind of this watch, thanks for very narrative painstaking description. Kudos to u Sir. Hola Stephen, muchas gracias por tu amable respuesta, veo complicado sacar el bisel por el alto riesgo de dañar el mismo, creo que no tendré el valor de hacerlo, pues no cuento con una maquina como la tuya, soy un simple aficionado. Agradezco me hayas indicado los colores a poner; veo que con pinturas acrilicas, yo pensaba que se aplicaba pintura de esmalte, estas pinturas son las que se usan en modelismo a escala?, no se corre el riesgo de que se caiga la pintura?. Nuevamente un saludo desde México. 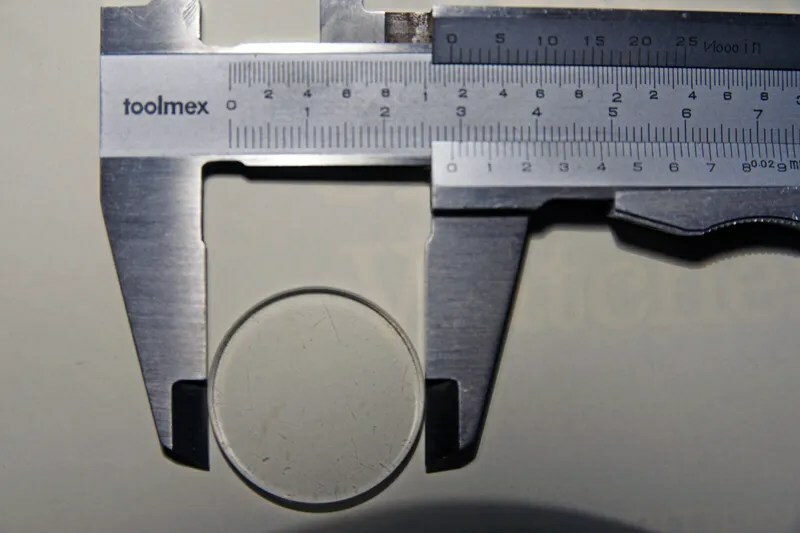 [Hello Stephen, thank you very much for your kind answer, I see it complicated to remove the bezel because of the high risk of damaging it, I think I will not have the courage to do it, because I do not have a machine like yours, I am a simple amateur. 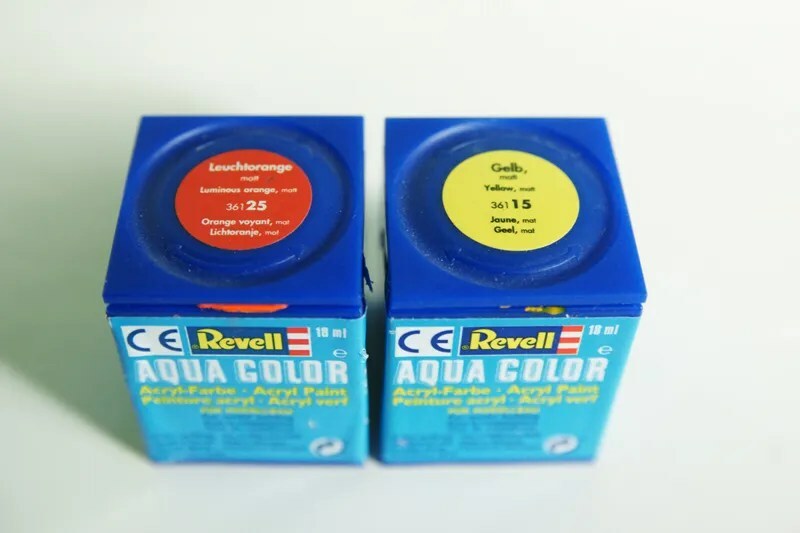 I appreciate you having indicated the colors to put; I see that with acrylic paints, I thought that applied enamel paint, these paintings are those that are used in scale modeling ?, do not run the risk of the paint falling ?. Hola Alfredo, es probablemente mejor dejar el bisel en su lugar a menos que necesite reemplazar el cristal. Con la ayuda de un pincel fino debe ser capaz de limpiar donde se une el caso. La pintura se utiliza para los modelos a escala, y funciona bien. Tenga cuidado de aplicar sólo muy poco, y en un golpe rápido. No parecerá correcto si es demasiado grueso, y no se verá bien si lo toca demasiado. La pintura no debe desprenderse – otras personas han aconsejado usar pintura acrílica como esta. La pintura del esmalte puede ser demasiado gruesa. Hola Stephen, una vez mas gracias por tu amable respuesta. He limpiado con un pincel como me lo indica, sin embargo, creo yo, que puede haber suciedad por debajo del bisel, por eso mi interés en retirarlo, pero como me lo indica es mejor no hacerlo y no lo haré. Gracias por los comentarios y precisiones en relación a la pintura, seguiré tus instrucciones. Podrías indicarme tu correo electrónico y si es de tu interés, te envío un par de fotos de mis relojes. [Hello Stephen, once again thank you for your kind reply. I cleaned it with a brush as it tells me, however, I think, that there may be dirt under the bevel, so my interest in removing it, but as I indicated it is better not to do so and I will not. Thanks for the comments and precisions regarding the painting, I will follow your instructions. Please may I have Brian’s contact details in relation to work on my Citizen Speedy? once again thanks a lot, I have missed one opportunity to buy at indian market that to for just inr.6000/-. Hopes, next time I may get that one and also I want to give it you as GIFT. HOPE U WILL ACCEPT IT. THANK YOU HAVE A WONDERFUL TIME. Hi Raghavendra, thanks for visiting my blog. Is it a ‘Speedy’ you are looking for? Hello again, can you tell me how to remove the tiges from my speedy? The problem is that the watchmaker after changed the glass.. Insert it again and now cant change time and day, works only the date. Any help? Sorry, i mean that the crown can t change time and the day, if rotate it, it change only the date. 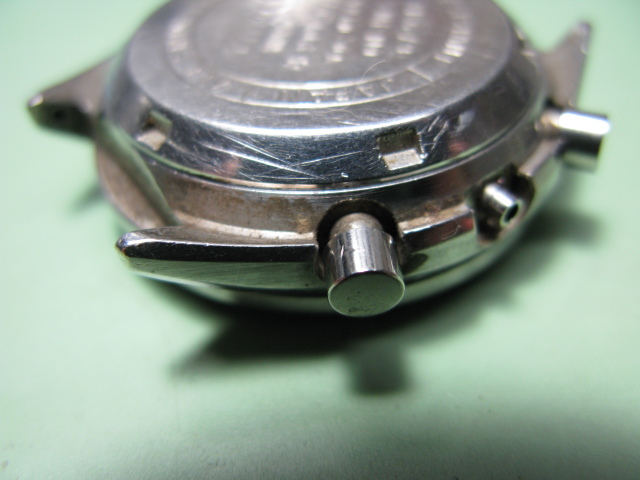 This problem came out when the watchmaker has re inserted the crown into the watch. No.. The problem is another. The crown, does not regulate the time, neither the day, can change only the time. Before, when i had not made the glass change, the crown was ok, it regulated the time, the day and the date. When re-fitting the stem, you press the button and push the stem in, then release the button, maybe rotating the stem slightly too, so that it clicks into place and can’t be pulled out. Be gentle when pressing the button, since they can jam when in the open position and the stem will not be held in place. Good luck with it I hope it can be sorted out. Hi Sam, thanks for visiting my blog. Examples of these, especially good ones, are getting harder and harder to find. I presume you check eBay – otherwise they can occasionally be found on Yahoo Japan. Do you know if Brian services/restores the 8110A with rotating countdown bezel? I have recently purchased one and am looking for a reliable watchmaker to service it. Hi Stephen. Im from Kuala Lumpur Malaysia. All i can say this really a fantastic blog about ‘Speedy’. As for yr info i just got one black Speedy. It seems that the previous owner replaced the chrono hands with some other unknown brand hands. I just wonder if i replace them with Mickey’s hands.. would it fit into my 67-9313? Hi Firdaus, thanks for visiting my blog and for your kind comments. Good to hear you have a Speedy 🙂 I’m not sure which ‘Mickey’ hands you mean, can you please let me know more, particularly which watch they are from. Thank you for this valuable site. Always a pleasure to read. Could you pass me Brian’s contact info, please. I, too, have a bullhead that needs some work. I’ve got a citizen bullhead I’d like to have worked on. It keeps great time but the chronograph doesn’t reset properly. Could you help with that and give me a general estimate of what something like that MIGHT run. I know it would just be a rough estimate and not something I could hold you too. Love your site. Thanks so much. Hi, I have a 1974 Monaco in need of a service at least. Could I get a contact for Brian please. It seems I have come to the right place. Another Speedy that needs some love. Would you kindly send me Brian’s contact info as well. Thanks for the help. good afternoon, My name is Milton from Cebu, Philippines, i have citizen speedy black dial like yours. its losing 10 minutes a day. what citizen caliber movement can be used to replace the hairspring since my watch tech said the hairspring is already weak. Good Morning Stephen, thank you for the reply, i thought there is a certain non chrono citizen that can be used. Thanks a lot ! NICE TO HEAR FROM YOU. Have you been to Cebu? Oh, forgot to say that I haven’t been to Cebu I’m afraid. Cebu is generally a safe place. 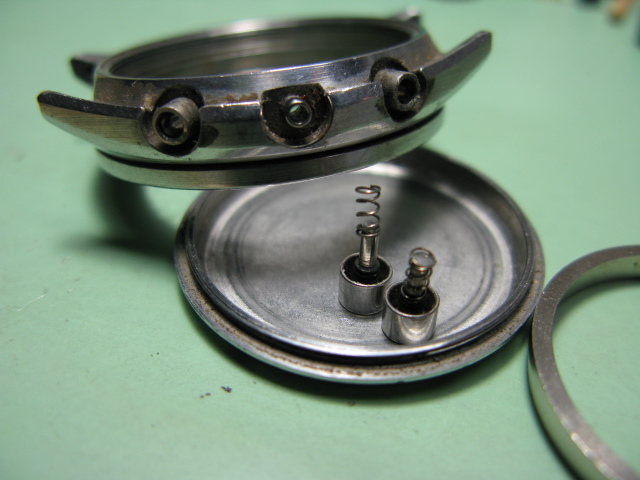 Good thing the technician found out that its the lock of the hairspring is loosened. Its running +5 mins. a day. Since you are a guru in watches may i ask whether the indices of the citizen flyback 9119 luninous or not? Can i use Tamiya hobby colors on them ? Just purchased an 8110a off Ebay. Looks good, supposedly fully serviced, but!… movement moves when i pull out crown! Assume it is missing movement ring. Where do I get one? Other issue is it only runs when chrono is running. Is this a big/expensive fix?? Have been offered partial refund. But what’s it worth? Difficult without seeing movement. Should have looked before I came on hols to Spain today! He says movement holder is present! I do like the watch. May try £150? Thanks for reply. Keep going with your blog/passion. It’s what keeps us ticking I think! Link is good. But mobile site. Hi Chris, sorry for slow reply been busy with family stuff. I still can’t find the item on eBay. Have you negotiated a refund now? Brian ever have any that you sell? Desperately want a white dial one. Feel free to email me if you have a wait list or anything like that. Your work is amazing! Looks like I found a white dial. Any chance of sending me Brian’s email for just a general servicing and perhaps a very light restore on it? Also now I am in search of a black one if anyone has one they want to sell! Thanks! I have a “Speedy” my father wore in the navy back in the late 70s, Its not running and the local repair shops here in Albany, NY have said there is nothing they can do. Could you put me in contact with Brian or anyone else that could help. This watch has quite alot of sentimental value to me and I would like to see it running again. 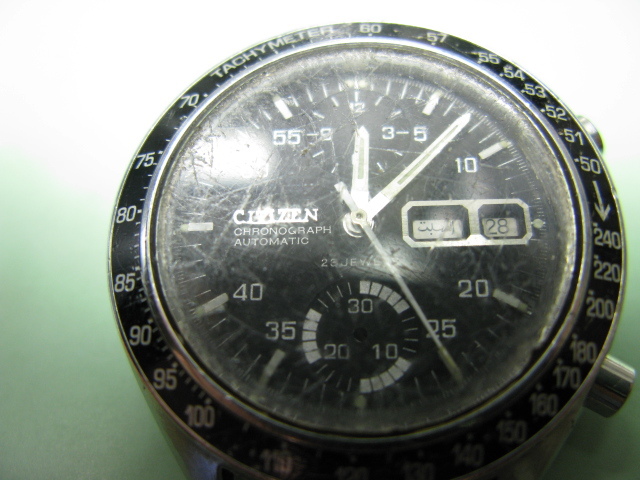 I have a citizen 1970s Bullhead 8110a that needs a new hair spring can’t find one any where i wonderd if you could help. 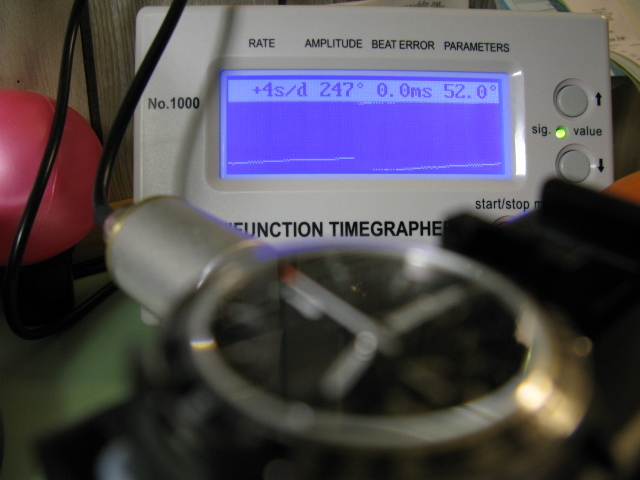 will using the chronograph function increase the wear and tear of the watch? is beat error of 0.2ms ok? is amplitute recorded same when fully would or half wound ? Hi Corn thanks for visiting my blog. 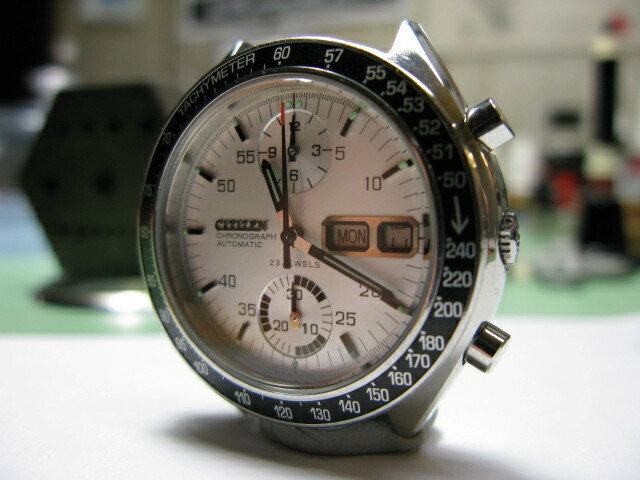 With the 8110a movement it is actually better to leave the chronograph running, since this produces less wear and tear. However, it is also recommended that the movement is run on occasion with the chronograph stopped, to avoid it seizing up in the running position. I’m not a watchmaker, but I understand that amplitude is measured at least twice, when the watch is fully wound and about half wound. As a watch winds down, the amplitude will reduce somewhat, as the mainspring winds down. I think 0.2ms beat error is ok, but best to check that – searching the internet should give lots of info – try Googling ‘what is good beat error’. Hi Steven. I’m Edwin Ipoh Malaysia. 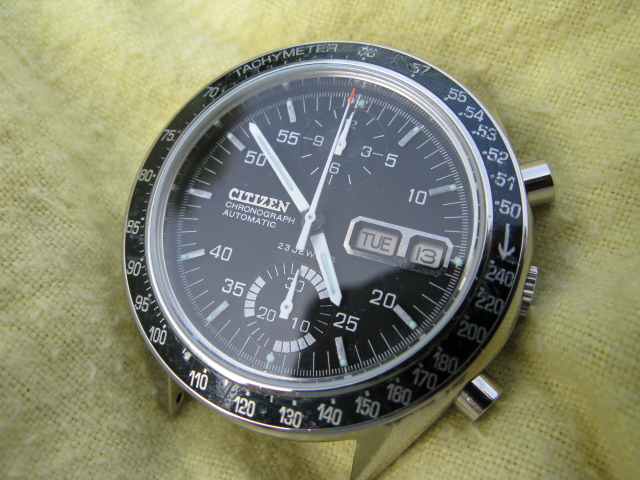 Currently I’m looking to purchase a citizen 67-9313 (speedy). Can you help me. Thank you for creating this great page on the 8110a Speedy!!! I am interested in purchasing the crystal that similar to original that Brian mentions. Can you send me something about that or Brian’s email address? But the problem is (Escape Wheel) is broken. Can you guide me, Which watch movement escape wheel is used in citizen 8110 movement.